The Irish Rovers are a Canadian Irish folk group created in 1963 and named after the traditional song "The Irish Rover". 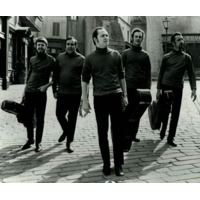 The group is best known for their recording of Shel Silverstein's "The Unicorn" in 1967. The primary voices heard in the group's early songs were Will Millar (tenor) and Jimmy Ferguson (baritone). All of the band members are from Ireland. Founding member George Millar is from Ballymena, long-time group member Wilcil McDowell is from Larne, John Reynolds from Belfast, Sean O'Driscoll from Cork, Ian Millar from Ballymena and percussionist Fred Graham is also from Belfast.. The Irish Rovers have represented Canada in no less than five World Expos, and throughout the years, have continued to tour worldwide. In 2010, the band celebrated their 45 years of sharing their music with the world by producing a CD and a DVD/television special filmed entirely in Northern Ireland.